Prime Minister Benjamin Netanyahu praised a “courageous” decision. Ambassador Nikki Haley slammed the organisation as “not worthy” of its name and said it made a “mockery” of human rights. The UN envoy noted that the human rights body had been given opportunities to make changes and had warned previously it would leave if essential reforms were not achieved. Haley, who has also criticised the council for its “chronic bias” against Israel, in a statement said that the Council had been a protector of Human Rights abusers for too long and a “cesspool” of political bias. “Our call for reform was not heeded,” she explained. “Human rights abusers continue to serve on and be elected to the Council. New York-based Human Rights Watch slammed the decision but Prime Minister Benjamin Netanyahu supported the US for a “courageous” decision. “Israel thanks President Trump, Secretary Pompeo and Ambassador Haley for their courageous decision against the hypocrisy and the lies of the so-called UN Human Rights Council,” Netanyahu tweeted. Foreign Minister Boris Johnson said the decision was “regrettable” but the UK would not pull out. He tweeted: “US decision to withdraw from the Human Rights Council is regrettable. The announcement came after Jewish organisations praised Johnson’s criticism of the Council over its ‘biased’ attitude towards Israel earlier in the week. Addressing the opening of the 38th council session, he honed in on the Council’s controversial Agenda Item 7, a permanent fixture devoted to discussing alleged human rights abuses in the Palestinian territories. Johnson said the UK viewed Item 7 as “disproportionate” and “damaging to the causes of peace,” and threatened to vote against motions under the clause next year unless the Council changes its behaviour. The US and Israel have called for the removal of Item 7. There had been speculation the US would appeal to the UN General Assembly and vote to eliminate it. The US consistently votes against Agenda Item 7 resolutions, while EU countries abstains. 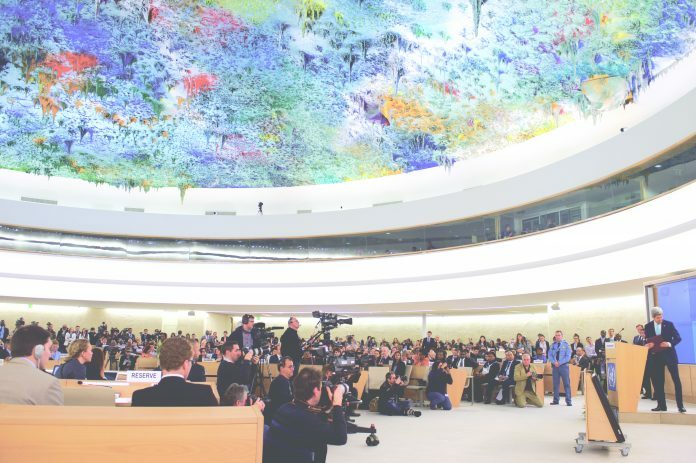 Sheila Gewolb, Board of Deputies senior vice president noted, “We welcome the Foreign Secretary’s bold, clear and important intervention at the UN Human Rights Council. “Alongside his strong speech on the importance of girls’ education, his commitment that the UK will vote against all resolutions in 2019 tabled under the infamous Item 7, which singles out Israel as the only country in the world to have its own agenda item, is an important victory for human rights.